Sony has received a lot of criticism in recent years for one simply reason: more was expected of this manufacturer in terms of design. Sony has a reputation for innovative design, and the expectations were accordingly very high for its new smartphones. But the Japanese manufacturer didn’t disappoint at MWC 2018 and they’ve proven to still be reliable in the smartphone market. Here are three reasons to await the release of the new Xperia XZ2. For a while now, critics have been lamenting that Sony smartphones had become boring, with a look that always copies the previous generation. And while the launch of a new Xperia has never been an event for design enthusiasts before, the announcement of the new Xperia XZ2 and XZ2 Compact has (somewhat) changed the game. Although I remained skeptical enough when I saw the leaked images, my visit to the Sony stand at MWC finally convinced me of the nice work Sony’s engineers were doing. With its new models, the manufacturer has finally abandoned its old Omnibalance design to shift toward a more modern look. The era of straight-angled smartphones is finally over, and the Sony brand is back with solid smartphones that stand out from the competition. The Xperia XZ2 offers an 18:9 aspect ratio screen and a curved body that is particularly pleasant to hold. The smartphone is nice to look at and offers the reliability of a top-range device. As the screen now covers about 80% of the front and the edges are thinner, the fingerprint reader has also been moved to the back of the device, making it more convenient to use. In short, Sony listened to its users, corrected its mistakes, and attracted new fans. In addition, the Xperia XZ2 now supports the Qi wireless standard. The battery offers a capacity of 3,180 mAh, and thanks to new Snapdragon 845 processor, the phone is supposed to have improved autonomy in comparison to its predecessor and 30% more power. The Cat.18 4G modem should theoretically allow download speeds of up to 1.2 GBit per second. 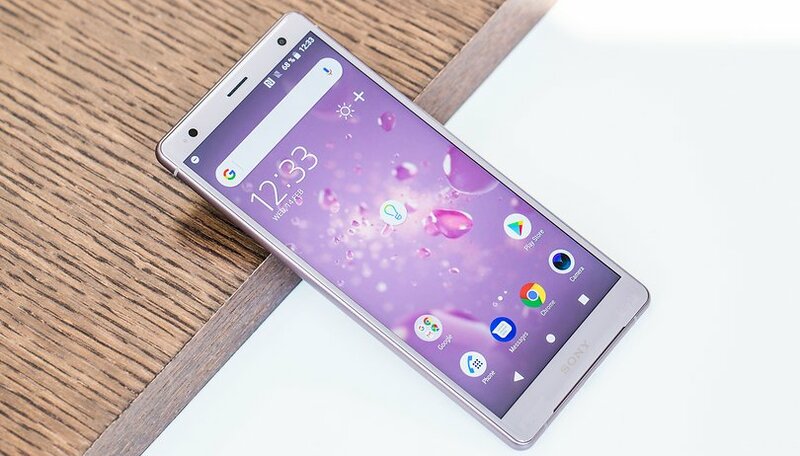 Since Sony knows that the majority of users use their devices for more than just calls, the Xperia XZ2 has significant entertainment benefits. And not only does the Xperia XZ2 have an HDR display, it can also now convert non-HDR content into an HDR format. Sony has also improved the vibration engine on its new smartphone. It is supposed to inform you more intensely for incoming messages, but it can also be used to improve the audio experience. By vibrating at a frequency of about 100 Hz, it is transformed into a kind of subwoofer. The intensity of this effect can be adjusted in the volume controls and it is clearly noticeable. The camera has also been changed. The XZ2 is capable of recording 4K HDR video at 24 fps. In addition, Sony has improved the resolution of its slow motion capture mode from 720p to Full HD. This high-speed burst at 960 fps must be triggered during video recording and is always limited to .182 seconds. The Sony interface has also been streamlined. Sony seems concerned with providing a seamless user experience, and the result is an all-around, featureless Android system that focuses on the essentials. Like its predecessor, the XZ2 comes with a scanning option that allows users to create their own 3D analyses. Sony has told us that the quality of the texture and definition has improved with the XZ2. It’s also possible to do a 3D selfie scan using the front camera of the device. Perhaps not everyone will be interested in this feature, but it is a neat quirk. So what do you think of the new Sony Xperia XZ2? Are you eagerly awaiting its release? As much as I like the design, still feels they could of done more for the front, thinner bezels, and looks bulky, design certainly isn't a strong point for Sony, but I guess if your housing a good speaker then they may of had to of done this for whatever reason, move the Sony Logo round the back, looks daft on the front of the phone. It'll be interesting to see what the reactions are with this phone, I had a Sony phone once and did like it, I changed because it felt bland and lifeless the older models, can't quite put my finger on it why, it was just missing something, so I hope the new range can Impress. It's got some stiff competition ahead of it when LG and Google unveil what they are bringing to the plate. Can't help but think the new line of Sony should of been brought out sooner rather than later. It's an intriguing design IMO. What interests me is how quickly it would get OS updates? If it's close to the Pixel then there's some serious hope that these will be popular if pricedpriced right. Wow, it's fine-looking and suitable for girls. Sony Xperia XZ2 is a very powerful phone, it looks pretty good, but the look is completely awkward: we are in 2018 and the phone has a thickness of 11.1 mm !!! And the weight of the phone, 198 grams, is two factors that prove Sony has forgotten that we are in 2018. Whatever the performance, a "brick" phone will not be appreciated by users, especially as the market offers much more accessible. The design of the phone is really weird. So bulky. Depends on its price point. I think Sony nailed it with the XZ2 Compact. Small enough to use with one hand, high end features, and very little extra that I don't need. Not sure how I feel about the 18:9 screen (can't we just call it 2:1? ), but the rest looks great. I broke my Pixel (which is just big enough to be annoying) about 3 weeks ago, and I'm eagerly awaiting news on the release of these phones. Depends on its price point. The design still doesn't excited me though the media features are nice. I'm more interested in what it supports across the USB c port. Video oout? And so on.